Yesterday I climbed a roughly 14,000 foot tall mountain in search of a missing hiker. As I've mentioned previously I am a Search and Rescue volunteer. The mission yesterday was my most physically demanding search so far. It all started out on Sunday when I got a call-out for a mutual-aid search near Bishop, Calif. I put down my homemade wood-fired pizza and responded that I would be there in the morning. Because Bishop is roughly 5 hours from Downtown Los Angeles I had to be up at 3:00 a.m. and on the road by 4:00. I threw my winter alpine, cave and 24-hour gear in the FJ and headed out to the San Bernardino County Sheriff's Office/Jail where we store our trucks and team gear. At the SO I met up with John Norman and Mark Kinsey and we promptly hit the road to Bishop. Four hours later we were in Bishop and were given details about the missing hiker we would be searching for. We then proceeded to hurry up and wait (standard SAR operating procedure) for an assignment. Finally around noon Kinsey and I were tasked with ascending Mount Agassiz to check the summit registry. The missing hiker always signed registries. If we didn't find his signature in the log we would effectively be narrowing the search area. The Forest Service was running helicopter transport to our insertion point. They requested that we don Nomex flight suits as a precautionary measure, one which we've never had to do before. Once in our suits they dropped Kinsey and I off one at a time in Bishop Pass. 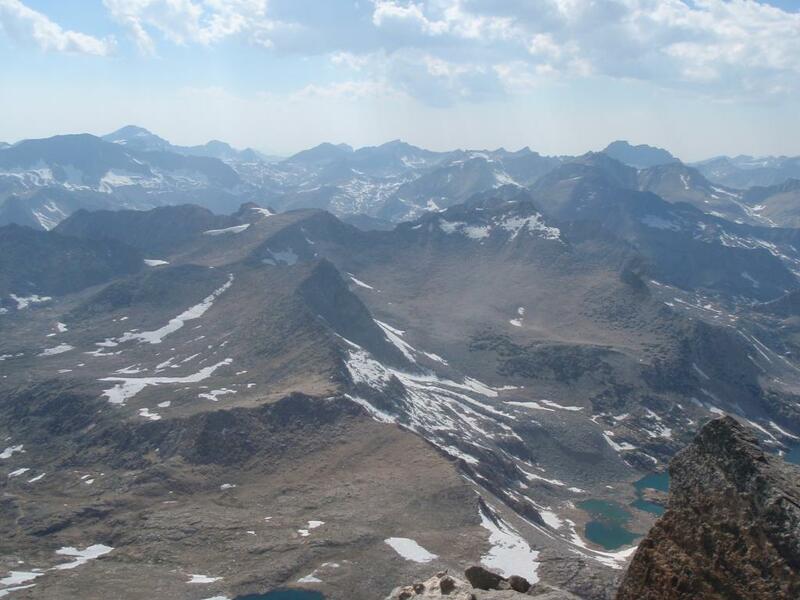 Bishop Pass is at an elevation of roughly 12,000 feet. Just a few hours earlier we had been at sea level. To say we didn't have much time to acclimate to the altitude would be a slight understatement. We began our ascent of the western face of Mount Agassiz at 1:00 p.m. On the map and as the crow flies, the distance from the base to the peak is only about a kilometer. Of course that doesn't include the 2,000 vertical feet included in the walk up. 2,000 vertical feet in under a mile wouldn't be too bad if there was a nice trail up. Mount Agassiz has no trail, and every step of the way is on top of loose boulders ranging in size from gravel to VW Bus. We made our way to the top in a little under 3 hours carrying 35 pound packs. The thin air had us stopping frequently to catch our breath. The loose rock made the ascent unnerving, especially when stepping on a large boulder caused it to shift. Once we were at the summit we took photos of the register, snacked and then radioed in to the Command Post. They informed us that if we wanted a helicopter extraction we would need to be back down to the Landing Zone by 6:00 p.m. We radioed back our concern that we may need to push it to 6:30 or later. They told us that 6:30 was the latest we could be extracted. We started on the descent, thinking that it would be faster on the way down. As it turned out it, scrambling down the loose boulders was more difficult than climbing up. When you step up on a giant boulder and it starts to move, you can simply unweight it. When you step down on a boulder and it moves you have already committed yourself and you can't just jump backwards uphill. At one point I stepped onto a boulder the size of a refrigerator and it slid about 3 feet down the mountain. I surfed it until it stopped and quickly hopped to the side. That was interesting. About half way down we called in to base and asked if there was any way we could be extracted later than 6:30. They said no. We decided to pick up the pace. We ended up making it back to the landing zone right around 6:45. Lucky for us, the helicopter was running late. We threw on our Nomes flight suits just in time to catch a ride down the mountain. Inyo Country SAR treated Kinsey and I to a nice dinner in Bishop and then we drove back to San Bernardino. I ended up getting home at roughly 3:00 a.m. The mission was extremely taxing physically. Ideally we would have started our ascent closer to 9:00 a.m. Either way it was a great mission, although unfortunately we did not find the missing hiker. Hopefully he is ok and will be found safe and sound. Update: Here area few articles about the search. Update 2: Unfortunately DeVan did not make it. His body was discovered today. The view from Mount Agassiz as seen on July 7th during a search for a missing hiker.